Street cruise, civil war days and the annual street fair in Orange. International foods, crafts, folk dancing and music. Many different ethnic foods and costume. The Street Fair has become known for the variety of food reflecting cuisine from around the world. They provide food, drink, entertainment and crafts to the visitors. Street Fair is located in a four-square block area radiating out from the center of the Orange Plaza, which is the intersection of Chapman and Glassell. Parking can be found at several public parking lots in the surrounding area for a fee charged by local non-profit organizations. Please be prepared to walk several blocks to get into the event. Eat, Drink, Dance & be Merry at Southern California’s BEST & Most DIVERSE OKTOBERFEST (voted by German World Magazine) with Oom-Pah-Pa Bands directly from Germany. Visit the Anaheim Craft and Vintage Fair to shop for one of a kind handmade items from local crafters. • Stop on by and have a great time! Please share with your clubs, groups, parish and stop on by to support this great craft/art/food event. Back 2 School Blast for the whole Family & It's ALL FREE! Brea Jr. High Park GIANT FAMILY OBSTACLE COURSE Carnival Games, Prizes, Relays, Giant Maze, Face Painting, Music, Arts & Crafts, Color Blast Zone, Interactive Performers (Dancers, Magicians, Martial Arts, etc.) And so much more! The festival features a spectacular array of family-fun activities including live music, art shows and a variety of tasty food. Interactive living-history encampments including blacksmiths, scrimshaw artists, and the infamous Port Royal Privateers are sure to entertain and amaze guests of all ages and are not to be missed. Additionally, you can explore the historic tallships and listen to the crew share tails of adventure and life at sea. A day of live music, performances and a special selection of regional Mexican handcrafts to celebrate Mexican Independence Day, with a special ceremony of the traditional "Grito de la Independencia" presided by Consul Mario Cuevas, Consul of Mexico in Orange County. All guests can participate in the "Best Mexican Regional Dress" contest for a chance to win prizes! Great Family Fun! Come see these small dogs race to the finish line during Oktoberfest at Old Wold Village. Arrive early and stay for lunch on their dog friendly patio. Admission during Oktoberfest: $7 adult, $3 kids 6yrs-12yrs, Free for kids under 5yrs. Admission tickets sold at the OKTOBERFEST LINE. Under 21 you must be accompanied by your parents. This year there will be over 100 breweries serving over 250 craft & import beers plus awesome food, live entertainment, beer seminars, all at the best location in Orange County. This is one beer fest where you won’t feel like you are choosing from the same brands you can get in your grocery store. No one under the age of 21 will be admitted. Fest of Ales is located in the heart of Downtown Anaheim and boasts over 40 craft breweries, taco vendors, live music, and games! Event will feature a home brew competition, unlimited craft beer tastes, unlimited gourmet food tastings, and one lucky brewery will be awarded the Mayor’s Trophy. Celebrating Polish culture with food, music dancing and exhibits. Dozynki is a celebration of thanksgiving after a bountiful harvest that dates back to 16th century Poland. It remains a long-standing tradition in Polish communities throughout the world, including the United States and Canada. The Dozynki will feature Polish folk dancers in traditional costumes plus delicious polish food such as freshly prepared stuffed cabbage, traditional pierogi, authentic Polska Kielbasa and Polish beer. Held since 1945, the event features a parade, carnival, food and car show in Fairview Park. The Fish Fry is presented to help raise money for local schools, clubs, and other organizations in the community. Event includes, fish fry, raffle, baby contest carnival and rides. The annual St. Norbertfest (formerly Oktoberfest) continues to grow and helps to build the parish, school, and the Orange community. There will be great food fun games such as Sumo Mania, bingo, raffles, exciting ridesand awesome entertainment for everyone—it’s a perfect time for fellowship! The world's largest one day car show dedicated to helping find a cure for Prostate Cancer. Traditional family barbecue in a casual setting featuring live country western entertainment, activities for children, live and silent auctions and riding demonstrations throughout the evening. Country western wear is encouraged! All proceeds benefit the programs of the J.F. Shea Therapeutic Riding Center dedicated to improving the lives of persons with disabilities through horsemanship. Featuring more than 100 performances representing cultures from around the world; international cuisine; kids' crafts and activities; cultural and religious exhibits; and an international marketplace. Immerse yourself in cultural displays, indulge in international cuisine, explore the International Marketplace and keep the little ones in motion with hands-on art projects, games and activities in a giant, interactive Kids Village. Festival admission and parking are free. Support access to the arts, history and education at Casa Romantica's 17th annual Toast to the Casa gala! Event includes Multiple stages with live entertainment (Big Band, a DJ spinning contemporary tunes, a charity casino, a spinning Wheel of Wine game, a performance by Moroccan dancers), Eclectic food and beverage fare (sample food, wine, beer, spirits and cigars from nearly 30 local vendors all evening), Exciting prizes and auction items, & a flawless patron experience with valet parking, ample seating and white glove service. Be Greek for the day! Enjoy authentic Greek food and pastries, live Greek music and dancing, shopping at the Greek bazaar, kid friendly activities and exhibits featuring Byzantine icons and traditional Greek costumes. FREE Admission and FREE Parking. Complimentary shuttle service to and from the SJC Metrolink Station. The Jazz Festival is a crowd favorite from people in and around Orange County. The outdoor event draws well over 12,000 people during the four-weekend musical jazz extravaganza in the month of September. A prime seating area is set up for visitors. People can also bring their chairs and watch the festival from their vantage point, as Brea Downtown sets the ambiance. There is a beer and wine garden, VIP seating area, fine arts & craft show and kid’s zone. Attendees can plan a grand Jazz night out by including dining and shopping at the various choices of restaurants and retail shops in Brea Downtown. General admission and parking is free. Haunted Houses, parades, carnivals and much more! Sample Imported German Beers, Bratwurst, Rotisserie Chicken, Hamburgers, Pork Sandwiches, Strudel, Pretzels & more. Guests can also enter the Beer Drinking & Stein Holding Contests, and of course do the Chicken Dance! Wednesday through Saturday are adult nights & Sunday’s are family day with Dachshund Races. We’ve serving FREE FOOD to the 1st 500 people in line. Free food is served at 7pm. In order to get the FREE FOOD you have to have a ticket and be one of the 1st 500 guests. Doors open at 6:30pm. Admission is FREE on Thursday during Oktoberfest. Under 21 you must be accompanied by your parents. The Orange County Children’s Book Festival is designed specifically for children of all ages. This family-fun festival attracts more than 30,000 visitors who will be entertained and delighted by authors, illustrators, booksellers, animals, storytellers, costumed characters, train rides, crafts, food and entertainment and much, much more. The Laguna Beach Plein Air Painting Invitational will be held in Laguna Beach, a famous seaside community and historic artist colony. North America's most renowned, plein air landscape painters will compete for prestigious prizes and participate for the week of events including public paint outs and artist meet and greets. Sponsored by the San Clemente Chamber, this event features a Chowder Cook-off, Fisherman's Lobster, Surfing Contest, Business Exposition, Arts & Craft Show and a U.S. Coast Guard Search & Rescue Demo Operation which all takes place at the historic San Clemente Pier area. Free shuttle parking is available at the San Clemente High School. Tustin Tiller Days has been a regular event in Tustin since 1957. The event provides an opportinity for Tustin to celebrate Orange County's agricultural heritage. Features Parade (on Saturday at 10 am), carnival, rides, food and entertainment. 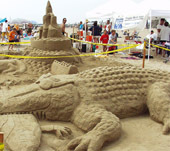 Hosted by the Commodores Club of the Newport Beach Chamber of Commerce, thousands of sightseers will descend on "Big Corona Beach" to view amazing sand sculptures created by participants ranging from the novice to the expert. Whether you're a participant or a spectator, it's a perfect way to spend the day with family and friends. Since 1965, this celebration of the city's heritage includes a parade and fair booths. The festivities begin with the Chamber of Commerce pancake breakfast at 6:30 a.m. followed by the parade and band review at 9:30 a.m. The festival begins at 9:30 a.m. and will feature many exciting activities for the entire family including the annual car show, a crafts fair, food booths, kids games and more. The Annual Silverado Country Fair and Folk Festival is one of the best family events of the season which explores the wonders of the area’s Old West rustic culture, great live Bluegrass, Country and Folk music, Wild West reenactments, handmade arts and crafts, 1800's activities & lock 'em up makeshift jail, tasty food, beer & wine saloon, plus some silly ‘ole timey’ contests, all nestled under the Oak trees below Orange County’s famous Saddleback Mountain. $6 adult admission, $3 kiddos, under 3 are free! This is “NOT YOUR MOMMA’S HOME TOUR”. At this self-guided tour, our guests will view 6 stunning homes located in Peralta Hills (Anaheim) and Yorba Linda. There will be 2 full house tours and 4 featuring great ideas for kitchens, gardens and entertaining spaces created by local designers, contractors and home owners. "Tasty Bites" and sips from local caterers, restaurants, bakeries and wineries will be available. Also, shopping can be done at the "Petite Boutique" featured at select homes on the tour. Event supports CHOC Children's Hospital. Held each October, this community festival includes games, crafts, contests, rides, food and fun for the whole family. Featured contests include Featured contests include a Car Show, a World Amateur Arm Wrestling Championship, a Amateur Horseshoe Contest, a Pie-Eating Contest, a Hog Calling, a Baby Contest, a Men's Leg Contest, a Dog Show, a Chili Cook-off and much more!! Presented by the Santa Ana Historical Preservation Society. This guided historical walking tour features costumed actors portraying colorful men and women who share stories from Orange County’s past. Docents will guide visitors through scenes that played important roles in the history of the county, culminating in a presentation in Fairhaven’s beautiful 1916 mausoleum. Comfortable shoes are recommended for the hour-and-a-half long walking tour. 714-547-9645 - Reservations are recommended. St Marys is having their annual festival to raise funds for the parish community necessities. There will be fun and games for the entire family. Great food and entertainment, opportunity drawings, rides, games and family fun! Doggy Dress Up & Kid Costume Party to celebrates Halloweiner & the last day of Kinderfest! There will be a Best Doggie and Kid Costume Contest on that day. It's a great family day during Oktoberfest! The kids can enjoy the dog races, carnival games, face painting, a bouncy house, DoDo the chicken, and join everyone on the dance floor for everyones favorite song, the Chicken Dance. List of ceremonies throughout Orange County honoring those who served our country. Held under the stars, this annual event serves up culinary masterpieces from over twenty of the areas finest restaurants, as well as sixteen premium wineries from throughout California, ice cold Microbrews and more. Tickets are limited to 250 guests. The ticket price ($95 - no tickets sold at the door) includes a complimentary "Taste of San Clemente" wine glass or beer mug, food, wine, entertainment and valet parking. Bring your whole family - this Health & Wellness Fair is a FREE event for ALL ages! Enjoy entertainment, raffles, photo booth, resources, kid’s corner with bounce house, face painting, balloons, free food and more! 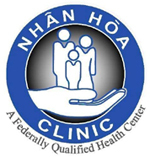 Free Flu Vaccines on Health Screening for: Dental (visual only), Vision, Glucose, Cholesterol, Blood Pressure, Behavioral Health, Bone Density, Hepatitis B & C, Anemia, Cervical Cancer, Breast Cancer, Body Mass Index & Other Services. Run for Education! A fund-raiser for the Tustin Public Schools Foundation, this year you can run and ride for education! The Dinosaur Dash features 4 events: 5k and 10k timed races for all ages, a 2k non-timed “Fun Run” and the non-timed 50k bike tour. After the race, there will be entertainment, a Food Court and Expo with games, activities and more. There's fun for the whole family. West Coast Gem & Mineral Show is back at a new location! 75 vendors will be showing minerals, fossils, gems, jewelry beads, crystals, meteorites, lapidary, decorator and gift items, lapidary and metaphysical supplies. Great Family Fun! 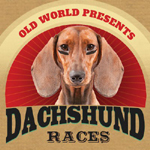 Come see these short legged but swift 'wiener dogs' race to the finish line once a month at Old World Village. Arrive early and stay for lunch on their dog friendly patio. $5 admission fee for adults, $3 for kids. Admission Tickets sold at #38. Under 21 you must be accompanied by your parents. The public is invited to a festive Lantern Parade around the little village of Old World. The Lantern Fest is a beautiful family affair that will mark the start of the festive season and fill everyone with Christmas spirit. It's free and enjoyable for all ages. Join in to celebrate the story of Saint Martin with lit lanterns and traditional songs. A European tradition, Saint Martin's lantern parades commemorate the story of a Roman soldier who shared his cloak with a beggar at a freezing winter night. This soldier, Saint Martin, later on became Bishop of Tour and lived a life full of kindness, sharing and helping the poor and underprivileged. The Lantern Fest will start with the registration from 4 pm - 5:30 pm during which hot chocolate, coffee and cake and also “Weckmännchen”, a traditional pastry, will be available for purchase. A short performance, telling the story of Saint Martin, will be followed by the lantern parade starting at 6:15 pm. Stay on after for the lantern contest results and to celebrate the season with Old World’s goulash soup and hot cider. Lanterns will be available for purchase during registration as well as tickets for goulash soup and hot cider to warm up after the lantern parade event. A fun surf competition where men, women and children dress like Santa or other holiday inspired characters and surf Salt Creek to benefit Surfers Healing. The 5k, 10k and a new 10 mile course is around the perimeter of the Yorba Regional Park, and the Santa Ana River trail. There will be a finish-line festival with silent auction, costume contest, food, fun and more! All of the funds raised by sponsors and race participants will directly support the Reeve-Irvine Research Center at UC, Irvine. California's Largest Thanksgiving Day Run Event - The Dana Point Turkey Trot - One of America's Most Scenic Runs... hosted by The Dana Point Chamber of Commerce. Tour the beautiful beach, majestic cliffs and coves of Dana Point. This flat, scenic race features a 10k, 5k and Kids Gobble Wobble. Participants will receive a shirt and medal. Tamale contest, dance performances by local studios, and musical performances by Soto, with its top 40, cumbias and salsa tunes, and the Mariachi Divas. There will be many vendors selling a variety of items, as well as many tamale vendors. Euclid St. between La Habra Blvd. and Lambert Rd.